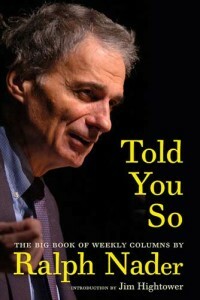 The column is the most natural literary form for a citizen’s advocate, and Ralph Nader may be its most robust and forceful practitioner. The Big Book of Ralph Nader Columns presents a panoramic portrait of the problems confronting our society and provides examples of the many actions an organized citizenry could and should take to create a more just and environmentally sustainable world. Drawing on decades of experience, Nader’s columns document the consequences of concentrated corporate power; threats to our food, water and air; the corrosive effect of commercialism on our children; the dismantling of worker rights; and the attacks on our civil rights and civil liberties. Nader also offers concrete suggestions to spark citizen action and achieve social change.